This is a 25 year old brewery in Spain and serves some excellent quality of beer. The place is a must visit for one and all. The place has a restaurant too and it serves delicious and scrumptious food. The Brewery: This is a special attraction at the place and is a one of a kind experience to visit a brewery like that of Flandes. 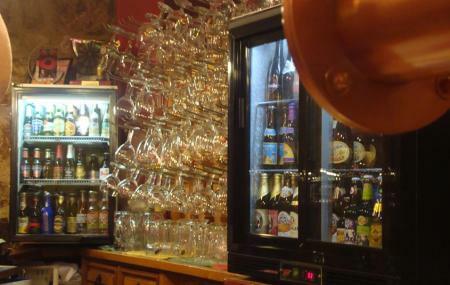 The place has about 10 beer taps and serves more than 100 kinds of beers. The Restaurant: The focus of the restaurant is a fine dining experience to all types of customers and has a dining room shaped like a tavern. The place attracts an exceedingly large number of customers. Try the beer as well as the food and don’t forget to visit the brewery. How popular is Cerveceria Flandes? People normally club together Museum Of Human Evolution Or Museo De La Evolucion Humana and Iglesia De San Nicolas De Bari while planning their visit to Cerveceria Flandes. The selection of beers is great; although the staff is unsympathetic. THE beer place in burgos. Genial, gran variedad de cervezas tanto en grifo como en botella. Además siempre te dan algo de picar. Y si pides chacinas están muy bien relación calidad- precio.